2019 Altadena Guild Home Tour! Save the Date Flyer! Click, download to print or e-mail to a friend. Advertising, click on the Events tab, click on Advertisers..
2018 Home Tour was a wonderful success - "Put Pep in Your Step on Pepper"
HMRI received a check for $67,000 from the Altadena Guild at the June 2018 General Membership Meeting. Once again $6000 was presented to Huntington Hospital's Constance G. Zahorik Appearance Center! The 2017 Altadena Guild's Home Tour - "A Stroll in the Altadena Highlands"
HMRI received a check for $65,000 from the Altadena Guild at the June 2017 General Membership Meeting. $6,000 was presented to HH's Constance G. Zahorik Appearance Center! 2016 Altadena Guild's Home Tour - "May Day on Porter"
HMRI received a check for $65,000 from the Altadena Guild at the June 2016 General Membership Meeting. 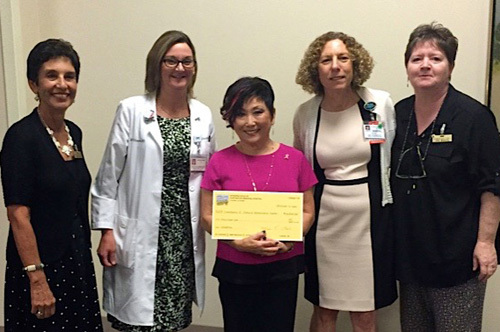 At the 2016 Altadena Guild October General Meeting, Marie Darr (far left) and Julie Manning (far right) presented Dr. Ruth Williamson, Director of the Cancer Center (left), Yo Zeiman (center), and Sheryl Rudie, Executive Director, Ambulatory Services (right) from the Huntington Hospital's Appearance Center with a check for $6,000. Along with our donation to HMRI, the Appearance Center is supported by the Guild for their work helping patients with their appearance, following illness and treatments associated with cancer and other conditions. Yo most passionately thanked the Guild for their donation to her important work. 2015 Altadena Guild Home and Garden Tour - "Bellissimo"
All refunds will be considered on a case-by-case basis. Please send an email to the Altadena Guild CFO, Subject: Refund Request at altadenaguild@gmail.com or USPS mail to Altadena Guild of HMH, 2591 Fair Oaks Ave, #106, Altadena, CA 91001. Names and credit card information are not stored on the AltadenaGuild.org website. Names, telephone numbers, and credit card information are never given or sold to anyone, any organization, or business. The Altadena Guild is committed to protecting our visitors' privacy. No goods or services are shipped by us. This webpage was established for the following purposes only: a) information about Altadena Guild of Huntington Memorial Hospital, which supports Huntington Hospital and Huntington Medical Research Institutes; b) accepting donations to the Altadena Guild; c) allowing members to fulfill financial obligations to the Guild. Since its founding in 1952, the scientists and physicians of Huntington Medical Research Institutes (HMRI) have helped improve medical and surgical diagnosis and treatment. HMRI is proud to have had the support of the Altadena Guild since its inception. HMRI is also proud of its affiliation with Huntington Hospital and its role in helping attract and retain some of the leaders of its medical staff and medical education program. Working together, HMRI, the Altadena Guild and the Hospital not only enhance the care available in our community, but foster innovation, discoveries and education that add quality years to the lives of people around the world. To learn more about HMRI, click here.